A Colorful variety of Recipes using your favorite Boyer Mallo Cups, Peanut Butter Cups, and Curl sauces. Recipes include: cakes, cookies, fondues, Mallo Mores, Pies, Puddings, Ice Cream Sundaes, Milkshakes, & Elvis's Banana & Peanut Butter Pancakes. 4-color photos inside as well as the history of your favorite ingredients. Did you know that Marshmallows were discovered by the Egyptians? 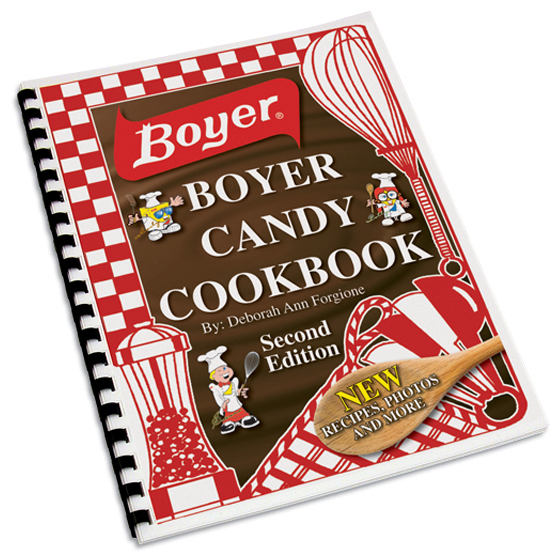 Find these and more in the office Boyer Candy Company Cookbook. This candy cookbook makes the perfect gift and is full of delicious candy recipes as well as insightful history and fun facts! Candy gifts make the best gifts and this cookbook is no exception.